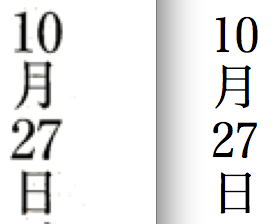 On the left is the blown up image from the CSS3 Writing Modes spec  and on the right is a similar example using Hiragino Mincho ProN with half-width variants. Next message: Jeremy J Carroll: "Re: rdfs:Graph ? comment on http://www.w3.org/TR/rdf11-concepts/#section-dataset and issue 35"
Previous message: John Daggett: "scaling glyphs for tatechuyoko text runs"